Put Your Cursor over these Words & See what happens!!!! Lewis Carroll never was married. He was shy as a child and stammered when he spoke. Alice in Wonderland began when Lewis Carroll was telling a nonsense story to little children. Lewis Carroll suffered from epilepsy, partial deafness and ADHD. Charles Dodgson based the sequal to "Alice in Wonderland", ("Through the looking Glass") on chess. Lewis Carroll's "favorite" number is 42, or so it is thought since the number 42 often appeared in his writing. Have you ever wanted to run away from your problems, to enter a mystical world where life is simple and everything isn't as it seems? Have you ever seen the glorious movie or read the book, "Alice in Wonderland"? Lewis Carroll accomplished just that when he wrote "Alice in Wonderland." Charles Dodgson was born on January 27,1832 in Daresbury, Chesire, England, though you may know him better as Lewis Carroll. 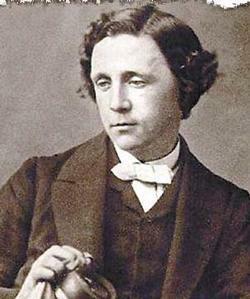 Lewis Carroll was the eldest boy in his family, though he was the third child. His family was easy going and he enjoyed his childhood. From 1846-1850 he attended Rugby School and graduated with high honors, especially in math. Afterwards he attended Christ Church in Oxford England for further studies. When he graduated he became a teacher/tutor at the college. On January 14,1898 in Guildford, Surrey, England Charles Dodgson passed away. "The Hunt of the Snark"
"A Boat Beneath the Sunny Sky"
"Speak Roughly to Your Little Boy"